I just returned from another trip to Nauvoo and once again, I was struck with the seriousness of the question of Letter VII. 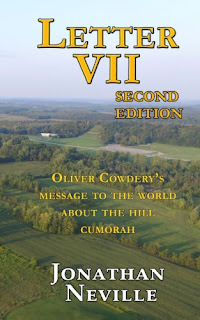 Oliver Cowdery's Letter VII, which Joseph Smith helped write and specifically endorsed at least three times, declares it is a fact that the Hill Cumorah in New York is the Hill Cumorah mentioned in the Book of Mormon (Mormon 6:6). During Joseph's lifetime, most literate members of the Church knew about Letter VII. Not only was it published in the Kirtland Messenger and Advocate, but at Joseph's direction it was reprinted in the 1841 Gospel Reflector in Philadelphia, the 1841 Times and Seasons in Nauvoo, and in a special pamphlet published in England in 1844. It was in this context that Joseph referred to Cumorah in D&C 128. When Joseph was alive, everyone knew Cumorah was in New York. It was never a question, and Oliver, as Assistant President of the Church, had declared it was a fact. After Joseph's death, Letter VII was published in the Millennial Star and the Improvement Era. But it has never been published in the Ensign. The New York setting for Cumorah has been consistently taught even in General Conference at least through the 1970s. No alternative setting for Cumorah has ever been taught in General Conference. Despite Letter VII, there remain many LDS scholars and educators who insist the "real" Cumorah is somewhere in southern Mexico. These people promote the "Mesoamerican" model of Book of Mormon geography, along with the so-called "Two Cumorahs" theory. They claim Joseph and Oliver were ignorant speculators who misled the Church about Cumorah being in New York, but now they, the scholars and educators, have figured out where Cumorah must be and for the last few decades, they have been working hard to persuade members of the Church that they are right and Joseph and Oliver were wrong. Give Brother Sorenson credit for expressing what these LDS scholars and educators actually think of those members of the Church who accept what Oliver and Joseph taught about Cumorah being in New York. The scholars' disdainful approach extends beyond Letter VII and members of the Church who accept it. They scholars are also disdainful of Church leaders who agree with what Joseph and Oliver taught about Cumorah, including Joseph Fielding Smith, Marion G. Romney and Mark E. Peterson. Every time you see or hear someone promoting the Mesoamerican theory, you know they think that what Oliver wrote about Cumorah being in New York is "manifestly absurd." They think that when Joseph endorsed Oliver's writing, he was endorsing a false narrative that misled the Church. I'm not saying anyone has to accept Letter VII. If you want to think it is "manifestly absurd" because LDS scholars and educators are telling you that, it's fine with me. What I am saying is that every member of the Church today should be as familiar with Letter VII as were the members who lived during Joseph Smith's lifetime. If people choose to reject Letter VII in favor of the two-Cumorahs theory, fine. But I think it's a big mistake to suppress the existence of Letter VII just because the dominant LDS scholars and educators disagree with hit.